Patrol Officer Glenn R. Miles, Sr. Inspector Clarence Jewell Trask, Sr. Inspector Robert Stuart Rumsey, Jr. 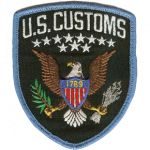 The United States Department of the Treasury - Customs Service has been absorbed by or is a component of the following.